This post is a collection of small projects I finished around the house. Some chalk painting, some graphics fairy framed prints, a small collection of wooden spools (on my very own wonderful almost grain sack roller towel, very vintage). I was looking in my fabric bags and saw something wonderful - blue stripes on a roller towel (vintage, with the most wonderful mends). New backdrop for pictures. Found a few more wooden spools, enough for a small sealer. I love mended vintage fabric. Looks like the edge was over stitched a bit with the original string that closed the sack. The Graphics Fairy's collection of vintage/very old images to the rescue again. 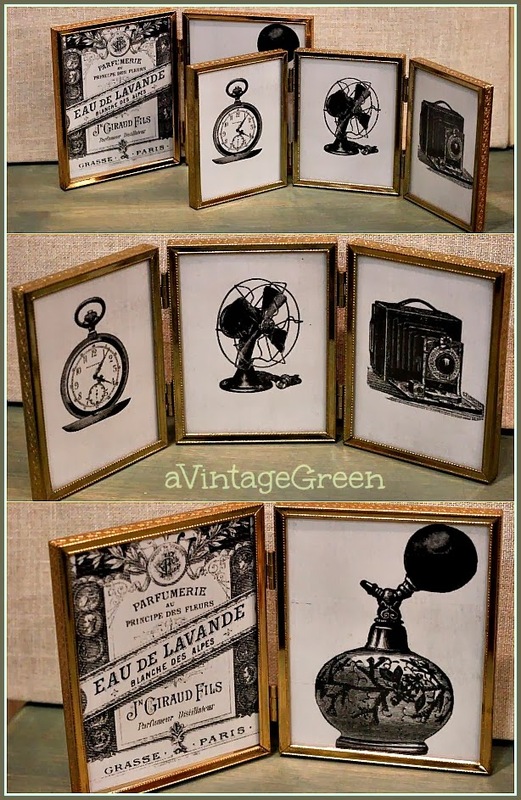 I needed to dress up these vintage folding metal frames. 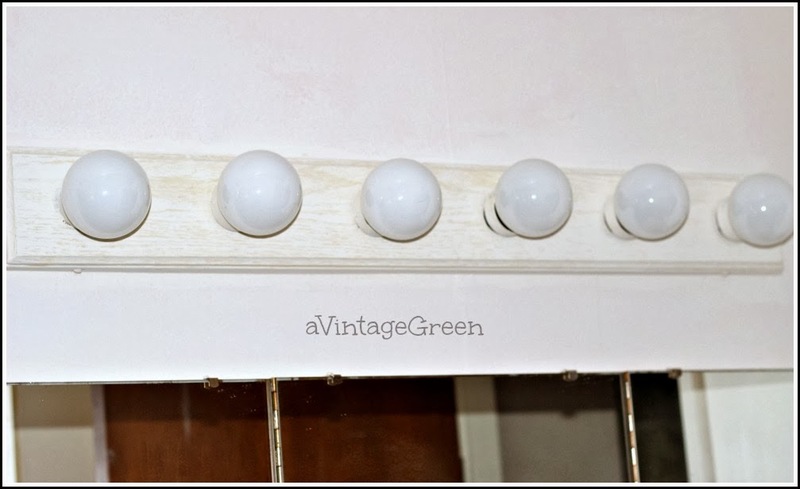 I've been meaning to make a small change to the bathroom light fixture. We changed it out originally about 20 years ago when we redid the bathroom and replaced the yellow fixtures for white, tore the room back to the studs, redid the walls, floor, lights and counter, all in pre-blogging days). 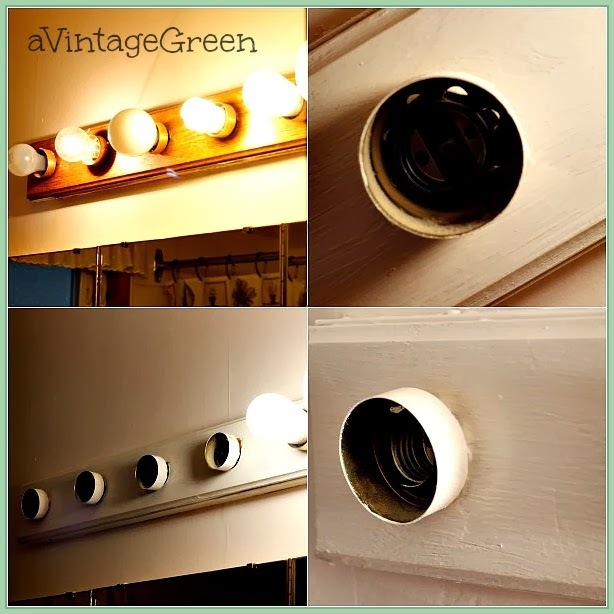 We were thrilled to have so much light in the bathroom with our new fixture. Those of you who reno know the drill. Thank goodness for a very kind plumber who talked us through the steps we needed to do before and after his share of the work. We also had the tiling and wiring jobs done by professionals. Our job was the gutting (what a lot of work! ), hauling away the results and then replacing the walls and floors and painting. Since then the peach walls were painted white and the oak with brass fittings frame lights seemed too prominent. 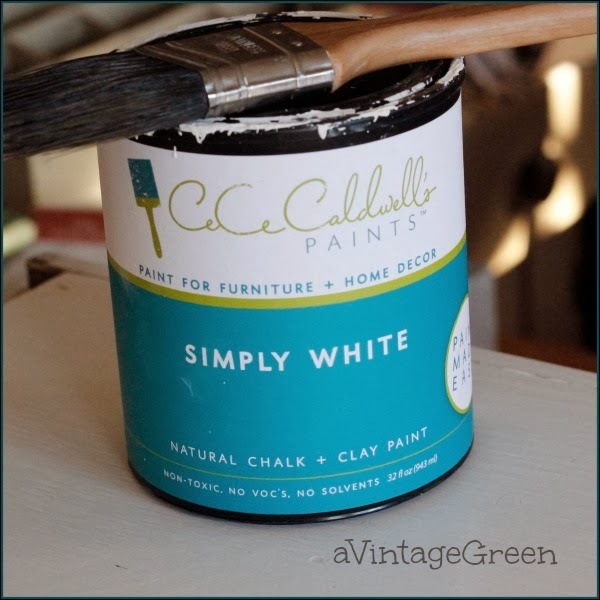 Got the short stepladder in from the porch, opened my tin of Simply White (CeCe), 2 coats of paint and a bit of 'touch ups', a set of 6 same sized bulbs and the job was done. Not the final solution for the lights. Quietens the room (for now). Not a great solution, should have used a primer first. Maybe try again later. Only clear photo I could get was Auto/flash for this one photo. This is number 8 in my goal to do one project a week, fourth project for February (I bundled a few small projects together this week). 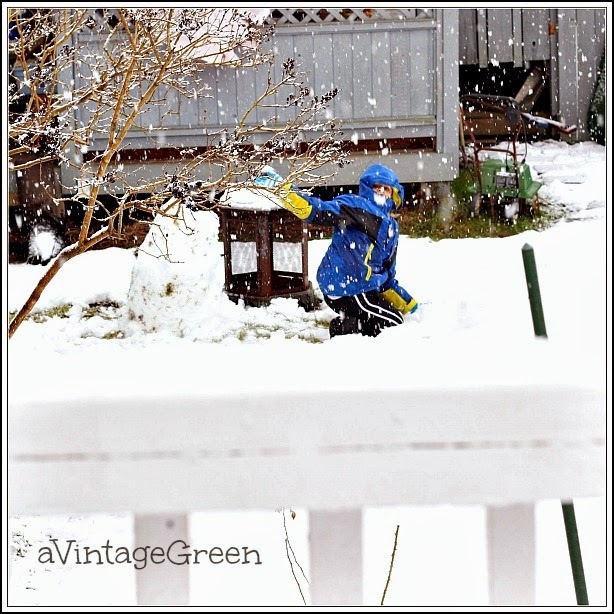 And another snow picture (yes, rare in late February in our area). An hour after I took this photo all the grass was again snowed under (DGS made 4 snowmen after school Monday). 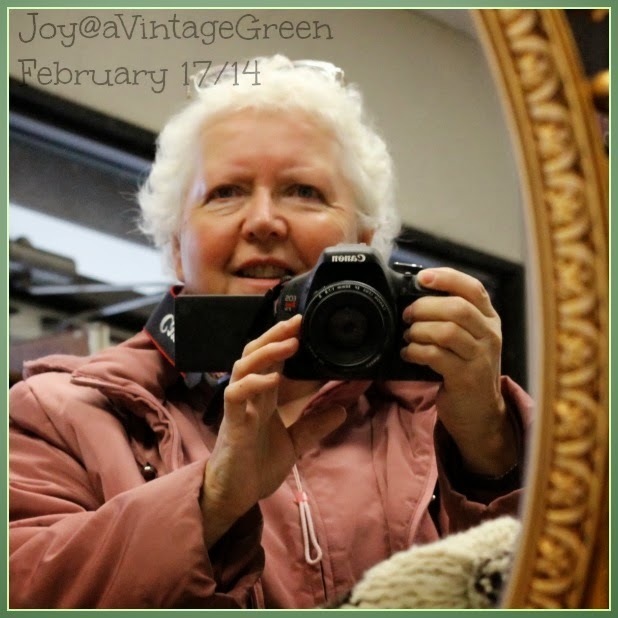 Next post will be March 3rd at 7:00 a.m.
My hair grew in curly when it returned so I thought I would 'share' the change. I am so grateful to have hair again, so hi from me. I have to take off my glasses (on top of my head in this photo) to focus the camera. All Things With Purpose (June 10/15) - final party with Sarah - thank Sarah, I've loved joining in. Curly? Just like mine! Thanks for the picture, Sister. I like to give myself challenges to stay on top of my projects. I have 2 days to finish my February challenge and I am not sure I will make it. Joy, you look wonderful!! Love all your great projects! I need something for my bathroom wall and you have inspired me! Joy - I love your curly hair!! Love those little black and white prints in the frames. Great job! Haven't run into you at our booths,,,but you look great! good morning Joy ... love that your hair came back curly. Bet you love it too. 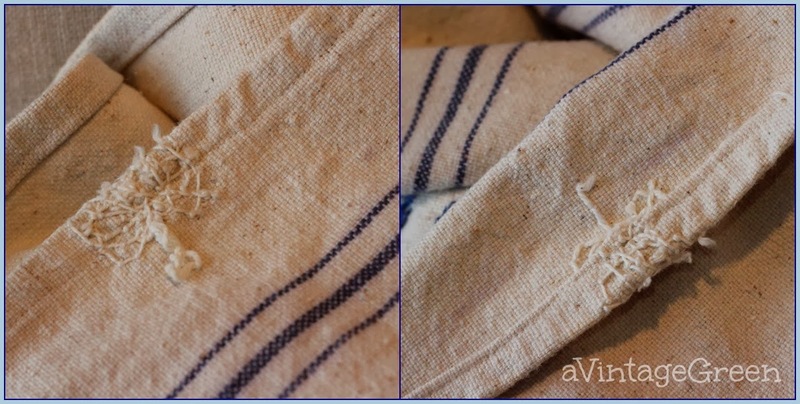 The old repairs in linen are so interesting ... the "old timers" took pride in their work, even mending. The framed graphics are so neat. Thanks for sharing your small collection of projects. You look fabulous! Congrats on the new curly hair and on getting projects done. Wish I could stay the same. Had my second post-chemo scan today, get results on Tuesday. There's just something so sentimental about things that have been repaired...love them! Thanks for sharing all of this with us. I thank you for the look at your framed graphics that inspires me. You look great with your curls!! Love the framed prints in the old frames, how unique. 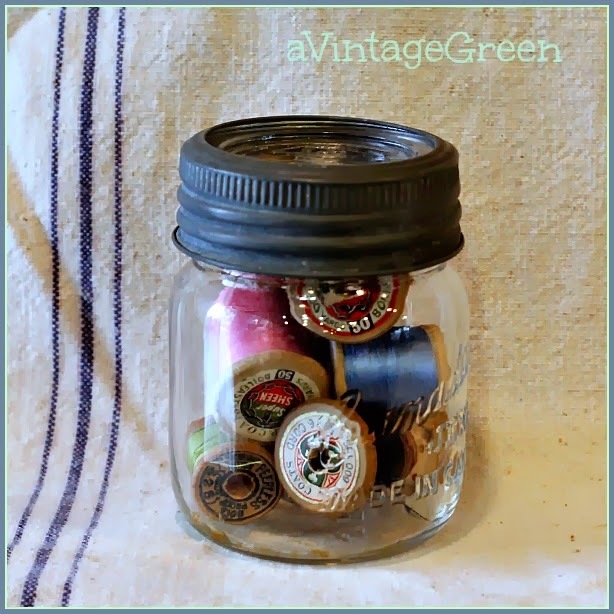 The jar of spool of thread are great too. I wish I had kept my mama's sewing box. We were so exhausted having taken care of them for three years that we let so much go that we should have kept. 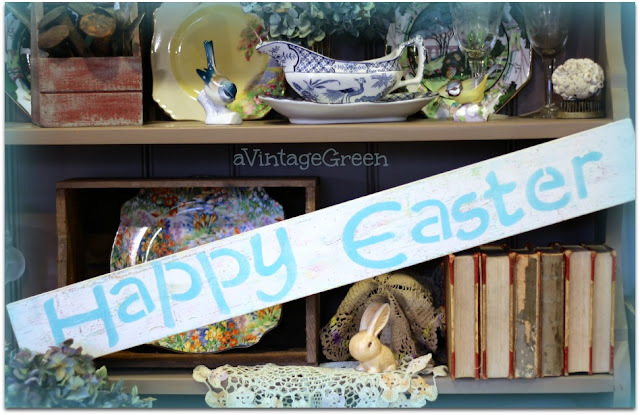 Great finds and great photos. Hi Joy, you are so handy at these projects. The framed prints are lovely. Love the curls too!